Woody Woodpecker is a 2017 American live-action/computer-animated comedy film produced by Mike Elliott and directed by Alex Zamm, based on the classic short films the cartoon character of the same name created by Walter Lantz and Ben Hardaway. 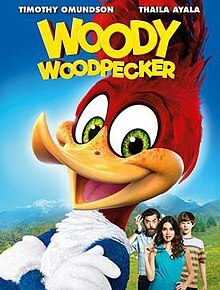 The film stars the voice of Eric Bauza as Woody Woodpecker, and also stars Timothy Omundson as Lance Walters, a divorced attorney with a son and a new girlfriend who wants to build a dream home in a forest in the mountains of Washington, only to find out he is cutting down a tree in which the eponymous woodpecker lives. While the movie was filmed in English, it was aimed at the Brazilian market, where the Woody Woodpecker character remains extremely popular to this day. The movie received mostly negative reviews from critics. In the Pine Grove forest in Washington state, Woody Woodpecker toys with two taxidermist poachers, brothers Nate and Ottis Grimes, and eventually causes them to tranquilize each other. Woody then pecks his name into a tree. In Seattle, Lance Walters, a real estate lawyer, gets fired after a video of him claiming wildlife conservation is unprofitable goes viral. He tells his girlfriend Vanessa that he intends to build an investment home on a large piece of property located near the Canadian border, left to him by his grandfather. Meanwhile, Lance's ex-wife Linda leaves their son Tommy with him and Vanessa, since she needs to visit her hospitalized father in Philadelphia. At the Pine Grove forest, Lance, Tommy, and Vanessa meet the park ranger named Samantha Bartlett. As Lance and Vanessa unpack, Tommy goes into the forest for a walk. There, he discovers and befriends Woody after he gives him peanut butter crackers. Woody visits the family at lunchtime and eats almost all of the food. Lance tries to shoo Woody away, but he accidentally wrecks the table and hits Vanessa in the face with a broom. The next morning, construction on the investment home begins, prompting an agitated Woody to cause chaos at the site. Later, in a nearby town, Tommy befriends a young musician named Jill, who persuades him to join her band in the annual Firefly Festival. Tommy is then saved from two bullies by Woody. As days pass, Lance grows more agitated because of Woody's constant interference with his project, and he goes to meet Samantha at the ranger station. She reveals that the woodpecker is an endangered species known as a red-crowned pileated woodpecker, which Native Americans saw as a god of mischief and chaos. Lance continues with his work, but Vanessa leaves him after Woody blows up their RV with her inside as a prank. Samantha eventually advises Lance to get along with Woody. Lance reluctantly attempts to surrender to Woody by giving him crackers, but Woody agrees to let him and the workers continue with their construction, as long as he is given crackers every day. Eventually, the investment home is completed despite excessive payment and extended scheduling. At the town's Firefly Festival, Tommy and Jill's drummer Lyle comes down with indigestion, prompting Woody to take over using a homemade drum kit. The performance is a hit, and Lance is surprised to hear that Woody gave Tommy some friendly support. Realizing that having humans around again isn't a bad idea, Woody heads back to the investment home and carves a mural above the fireplace. However, as he signs his name into the carving, he accidentally burns the house down after hitting exposed wiring. Ashamed of his mistake, he flies back to his tree. Infuriated by this, Lance hires Nate and Ottis to hunt Woody down. The brothers find him and tase him unconscious. As they leave, Tommy reprimands his father and runs away. He then forms a plan to rescue Woody and heads to Grimes' shack with Jill and Lyle, as the brothers try to sell Woody at an online black market auction. Lance finds the mural that Woody had created. Having a change of heart, he enlists Samantha's help and they set out to find both Tommy and Woody. However, everyone is captured by the brothers. As Nate grabs a tranquilizer, Lance tilts his cage towards Woody's so he can free him. After beating the brothers, Woody chases them as they attempt to flee to Canada. He carves a hole in the middle of a bridge, and the brothers fall into the river below, where they are later arrested. Later, Lance apologizes to Woody for not knowing that the house fire was an accident and therefore replaces Woody's cut-down tree with a birdhouse. Woody accepts both the gift and the group to be called his new family, much to their generosity. That night, as Lance and Tommy fall asleep in a tent, Woody carves the words "Home Sweet Home" into the new birdhouse, only to accidentally make it topple onto the tent. After the credits, the Woody Woodpecker cartoon Niagara Fools is shown. Eric Bauza as Woody Woodpecker (voice), a hyperactive, rare and mischievous pileated woodpecker. Timothy Omundson as Lance Walters, a Seattle lawyer who is the ex-husband of Linda, Tommy's father and Vanessa's boyfriend. The name Lance is a reference to Walter Lantz, who created Woody Woodpecker. Graham Verchere as Tommy Walters, the teenager son of Lance and the best friend of Woody. Jordana Largy as Samantha Barlett, the park-ranger of Pine Grove. Ayala was cast to add appeal for Brazilians. Adrian Glynn McMorran as Ottis Grimes, a dummy furtive poacher and partner and younger brother of Nate. Scott McNeil as Nate Grimes, a furtive poacher who want to capture, dissect and to sell Woody in auction. Chelsea Miller as Jill Ferguson, a teenager bass guitarist who becomes Tommy's friend. Jakob Davies as Lyle, a drummer who is Jill's friend and becomes friend of Tommy. Sean Tyson as George, a builder who directs the building of the new house of Lance. Patrick Lubczyk as Chris,a bully who is the partner of John and threatens Tommy. Ty Consiglio as John, a bully who also threatens Tommy in one part of the film. Emily Holmes as Linda Walters, Lance's ex-wife and mother of Tommy. Karin Konoval as Barbara Krum, the receptionist for Lance. The film collected only eight reviews on English-language review aggregator Rotten Tomatoes, which reported a 13% approval rating and provided no critical consensus. Common Sense Media rated the film 1 out of 5 stars, stating: "Inanely cruel villains, an unoriginal story, ham-handed performances, and reliance on farts and burps are the low lights of this awkward effort to bring back a less-than-engaging cartoon bird." The film was first released in theaters in Brazil (under the name of Pica-Pau: O Filme) on October 5, 2017. As of March 11, 2018, Woody Woodpecker has grossed $15.3 million. It debuted at $1.5 million, finishing second at the Brazilian box office behind Blade Runner 2049. The movie increased by +45.4% in its second weekend, moving to first place with $2.1 million. It was released in the United States and Canada on DVD, Digital HD, and Netflix on February 6, 2018 and on Blu-ray on September 4, 2018. In the United Kingdom, the movie was distributed through British home video distributor Dazzler Media, under license from Universal. ^ Harper, Blake. "What the New 'Woody Woodpecker' Movie Says About Kids Entertainment". Fatherly.com. Fatherly. Retrieved 16 September 2018. ^ "Woody Woodpecker". BoxOfficeMojo.com. Box Office Mojo. Retrieved 16 September 2018. ^ "Woody Woodpecker". Rotten Tomatoes. Fandango. Retrieved April 18, 2018. ^ Schonfeld, Renee. "Woody Woodpecker - Movie Review". Common Sense Media. Retrieved April 18, 2019.